Thomas & Betts Red Dot® Deck grommet pro in black color, features non-metallic construction. It measures 9.18-Inch x 4.75-Inch x 2.875-Inch. Hole cut-out measures 3.6-Inch x 8-Inch. It is great for outdoor living spaces and light commercial raised deck applications. It comes with duplex adapter plate for use with conventional TR/WR duplex receptacle. It offers a safe and aesthetic solution for outdoor raised deck applications. Deck grommet pro is perfect for residential recreation areas, outdoor restaurants and hospitality recreation areas. 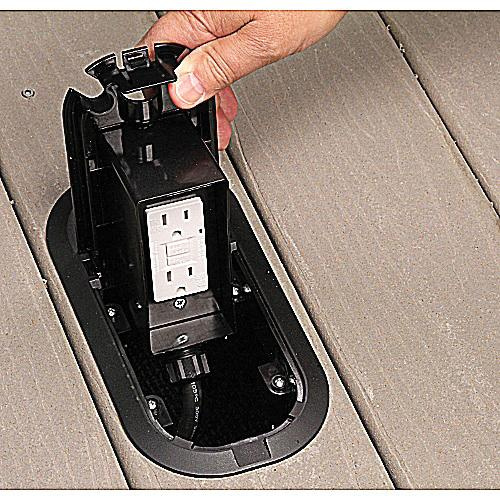 Deck grommet pro is UL listed, cULus listed and meets NEC requirements. * Inventory displayed is accurate as of 04/21/2019 02:40 EDT.